Hi greenies, boy am I fired up and ready to tell you all about GMOs. 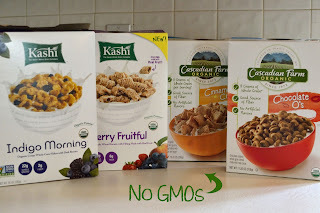 Call me crazy for just now jumping on the anti-GMO bandwagon, but to be honest I really thought I was doing a decent job of keeping them out of my family's food...but I was wrong. For those of you who don't know, GMOs stand for: Genetically Modified Organisms. GMOs are basically food or animals that have had their DNA tinkered with, often so the crop can withstand heavy doses of pesticide spray (think Round Up and Monsanto) or so that it can kill insects that try to eat the crop. The even more twisted part of GMOs that they combine the DNA from two SPECIES that wouldn't normally reproduce in nature. That just sticks in my mind as being especially odd. Now what are the health implications that come from combining the genes from two species? Good question...no one knows! that all combined in the food we eat. Now those definitions are all nice and fine but the real ramifications go much deeper. GMOS have been linked with producing toxins, allergens, and inflammation in the body which can lead to birth defects and even cancer. Talk about losing your appetite. Recently a friend let me borrow a copy of the documentary, Genetic Roulette, and although it took me several weeks to finally getting around to watch it, when I did I was shocked....and kicking myself for watching or learning about this sooner, but I'm letting that go. 1.) The fact that Bt (a toxin used in some genetically modified foods) was being found in blood of pregnant women and newborn babies. 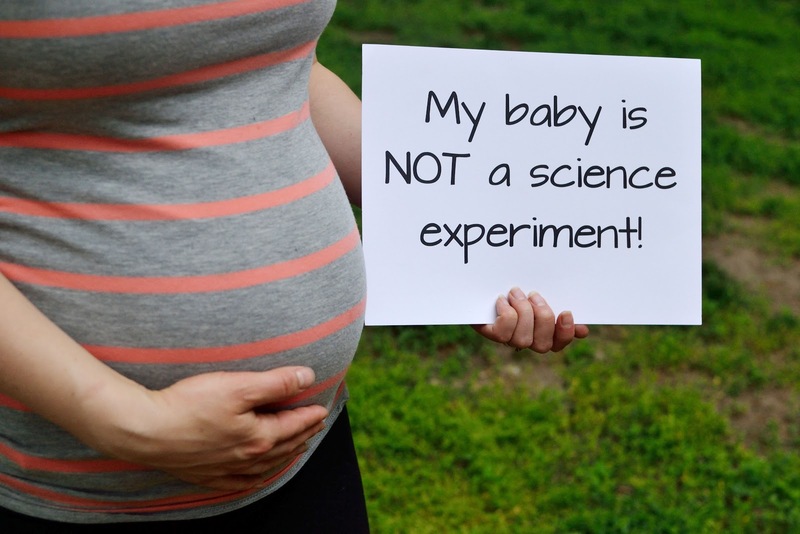 You heard me right, pregnant women and their babies...you've got to be kidding me! Hold the phone.... are you saying I could be giving my unborn baby GMOs and other toxins related to those GMOs because of food I'm eating right now? What did I pass onto Avery? You've got to be________ (fill with your choice of curse words) kidding me!" As a mom and especially a pregnant mom, the last thing I want to hear is that I am harming my unborn baby in some way and now you're telling me I could be passing on the Bt toxin just by eating a simple bowl of chips and salsa? As I said before Bt is used is genetically modified foods because it is capable of killing any insect which tries to eat it, which is probably great for keeping crops alive, but what happens when we eat it? Clearly it stays in our system as based on this study, and from there what damage does it do to our bodies and our baby's body? Good question, wouldn't it be nice if it was being tested for safety? Fat chance. 2.) 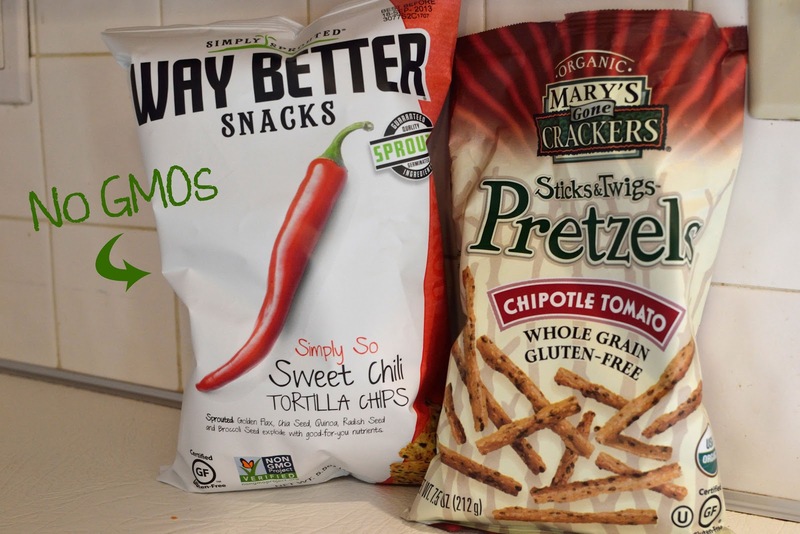 The second fact that really resonated with me was that GMOs are most likely the culprit when it comes to the dramatic rise we are seeing in food allergies. 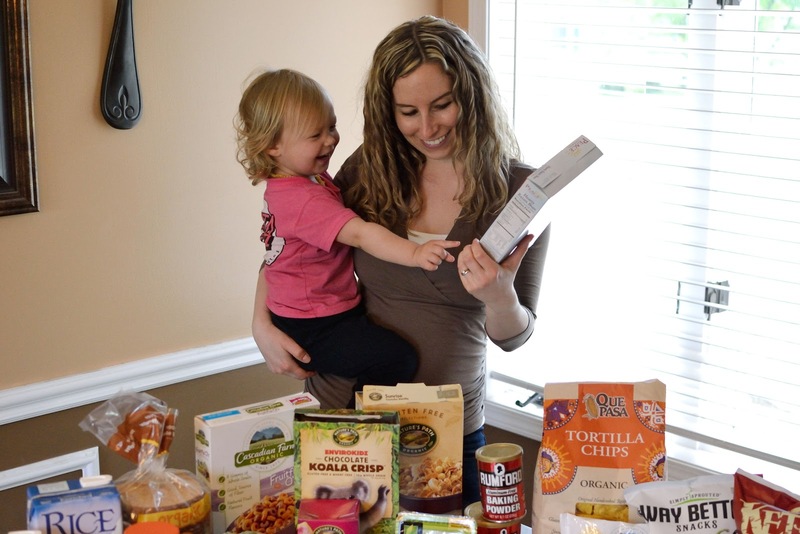 In the March of 1999, the UK who tracks their food allergies yearly, found that they had increased 50% from the previous year, and ironically in the prior year genetically modified soy had just entered it's their food system (learn more here). Also, between 1997 and 2002, the rates of peanut allergies doubled. 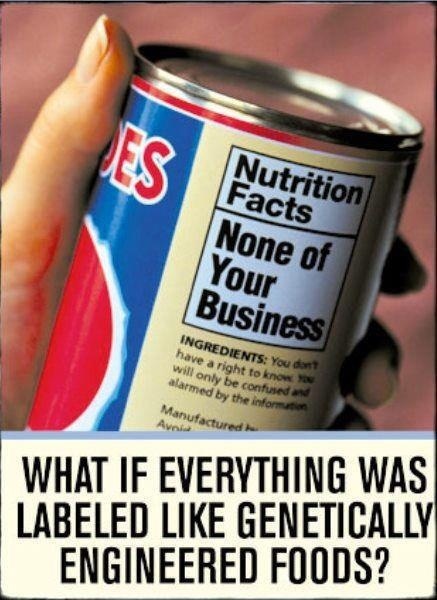 What was in the food now that wasn't ten years ago or even twenty years ago...you guessed it: GMOs. To the body, GMOs are foreign invaders, food molecules they have never come in contact with so what do they do? Attack. So even though you think you are just ingesting a typical ear of corn or normal stir-fry cooked with canola oil...your body reacts to it as though it as though it's a harmful substance which manifests itself in food allergy symptoms (hives, itching, swelling of the throat, etc.). This personally affects me because several years ago I came down with horrible digestive issues that plagued me daily, and it wasn't until getting a food sensitivity blood test that I was able to discover that I was "sensitive" (kind of a mild, but still uncomfortable version of a food allergy) to a number of foods such as: yogurt, cow's milk, wheat, gluten. When given this list of foods that I was now unable to eat, I spent some time wondering and researching where did this come from? How did I get this? I didn't have these sensitivities as a kid, my whole family isn't allergic to these foods? Why do I have them and why do I have so many? Basically found nothing...until now. 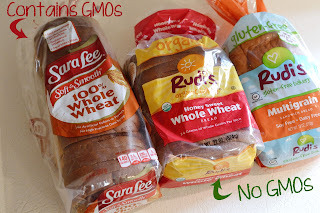 It clicked like a light bulb me, what if GMOs caused my food allergies? Whether it was rBGH (a hormone given to cows to make more milk) that was in the milk I was putting on my cereal or the yogurt I ate daily, or the full of preservative-full pre-packeged snacks and dinners I was always eating, I couldn't help but wonder if that was where my problem stemmed from. To this day, I still follow a gluten-free, vegan diet which stemmed from my many food sensitivities, but now I don't 100% better. I have to take a digestive enzyme twice a day and a pricey probiotic just to keep my digestive system happy. After learning about GMOs and realizing that I was still eating them, I wondered if that was why I still had issues from time to time. I wondered if I could remove them completely from my diet would I feel better? Not that I feel completely bad now, but how good could I feel if I was off all the genetically modified food that was confusing the heck out of my body? Truly those two points are just the tip of the iceberg when it comes to my awakening to GMOs. And after watching the documentary, I spent the next few days and weeks learning, Googling, reading more books about GMOs and taking in as much research as I could about their dangers, as well as what foods they are most commonly in, and how to avoid them. The next step was to take a walk through my kitchen to see if I was indeed consuming GMO foods without even knowing it. The answer...yes of course I was. Don't have time to watch the video? Let me break it down in pictures and tell you where GMOs are most often found. So if a food is made from one of those four ingredients and is NOT organic, there's a pretty good chance it's been genetically modified. Other commonly genetically modified foods include: alfalfa, papaya, zucchini, and yellow summer squash. Amino Acids, Aspartame, Ascorbic Acid, Sodium Ascorbate, Vitamin C, Citric Acid, Sodium Citrate, Dextrose, Ethanol, Flavorings ("natural" and "artificial"), High Fructose Corn Syrup, Corn Flour, Hydrolyzed Vegetable Protein, Lactic Acid, Maltodextrins, Molasses, Monosodium Glutamate (MSG), Soybean Oil, Soy Flour, Sucrose, Textured Vegetable Protien (TVP), Xanthan Gum, Vitamins, Yeast Products. 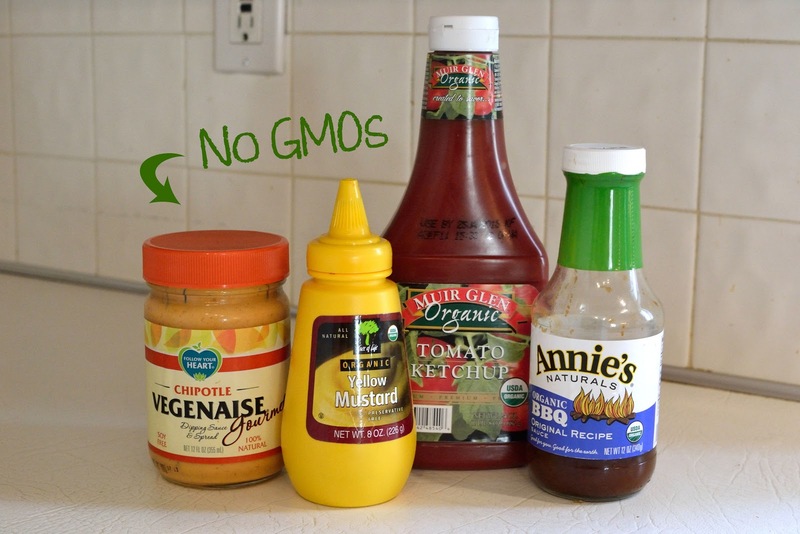 Find the complete list of "invisible GMO ingredients" here. 1.) 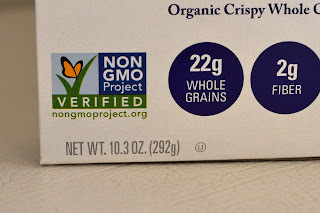 The Non-GMO Project label (aka "the butterfly" as Avery calls it in the video). 2.) Or a "Certified Organic" label. 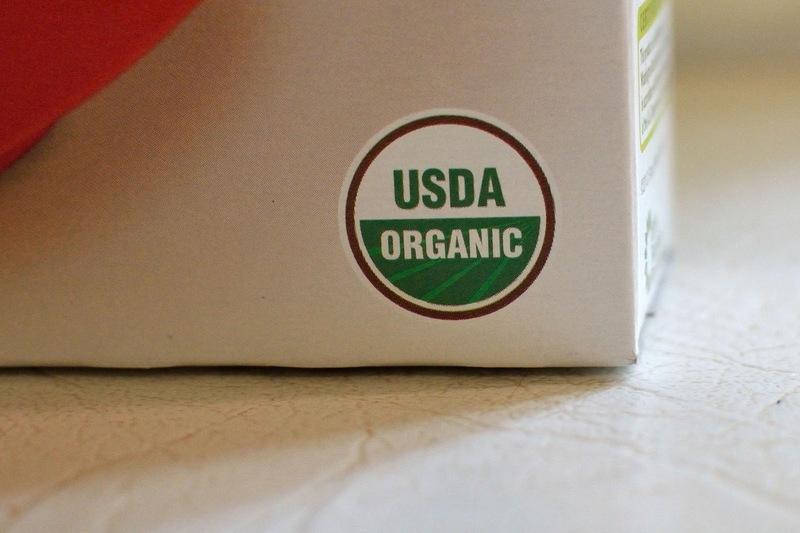 For a food to be considered "organic" it can NOT contain genetically modified ingredients. 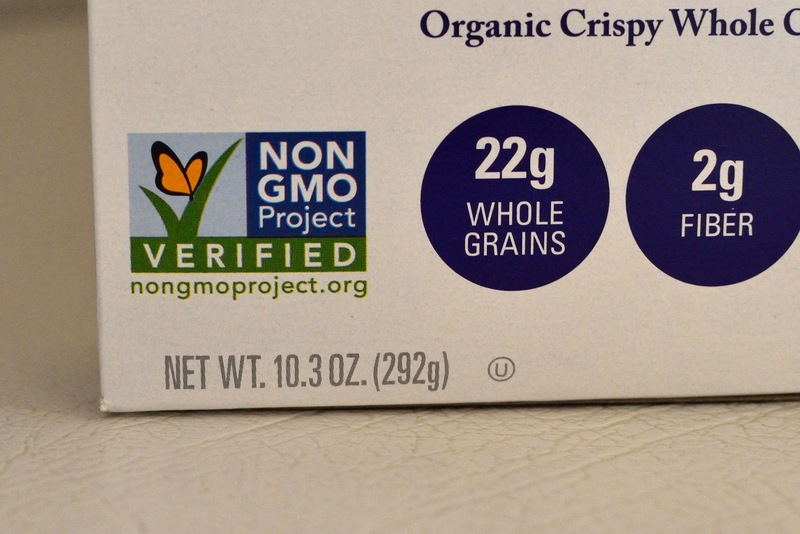 Now instead of playing food detective, wouldn't it be nice if each food was labeled as to whether it contained GMOs? Yes! But as many of you know, Proposition 37 did not pass last November in California, a ballot measure that would have required food containing GMOs to be labeled. Did you know that 61 countries have mandatory labeling of GMOs, but the US and Canada do not? Now even though Prop 37 did not pass, 23 other states are working on passing mandatory labeling of GMOs, so that is promising. And on top of that, 92% of Americans want GMOs labeled. (source) So hopefully it's just a matter of time. But until then, thank goodness for the Internet and these two labels. "Yup, that's my Non-GMO food!" 1. Most fruits and vegetables. 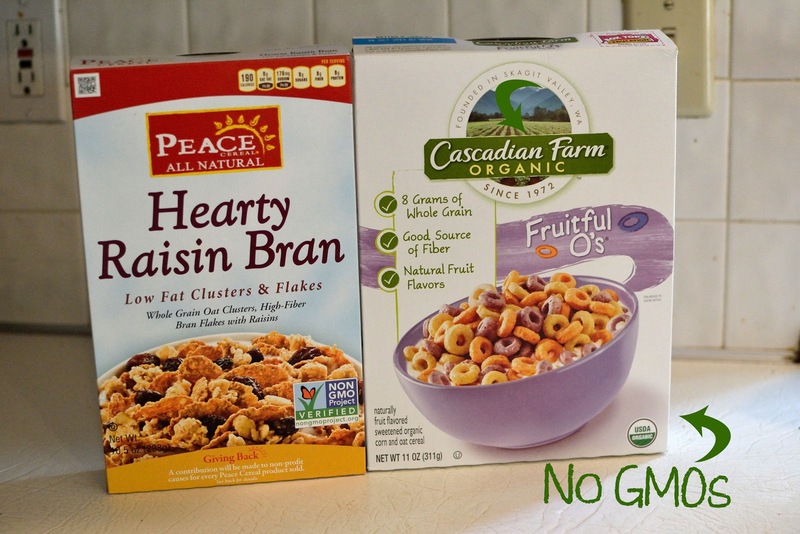 I try to buy mainly organic, so in being organic I can trust that they are GMO-free. 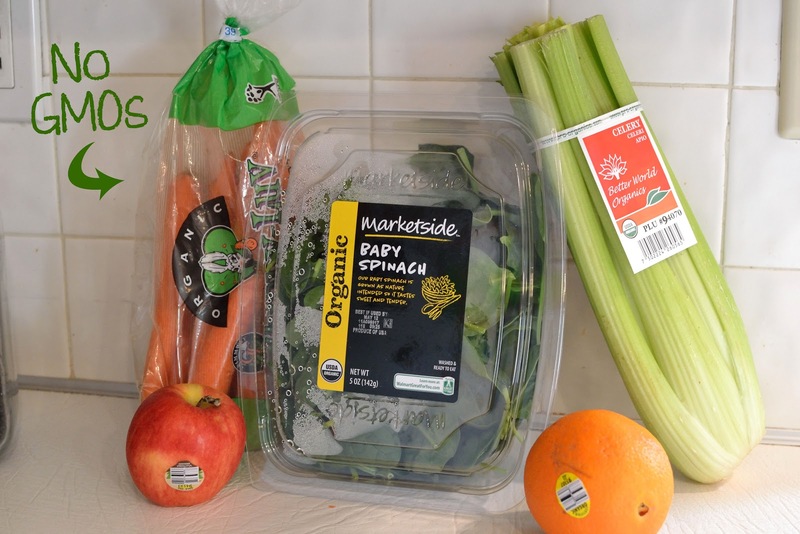 Organic carrots, spinach, Gala apple, Navel orange, and celery. 2. Grains, beans, and baking flours. 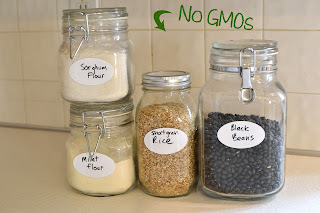 I buy most of my beans and rice in bulk and organic, even if you are eating them conventional there's a pretty good chance they as long as they are the only ingredient (no oil added) then it's GMO-free. When it comes to baking flours (they aren't soy or corn-related) most are safe like this sorghum flour and millet flour (common gluten-free flours). 4. 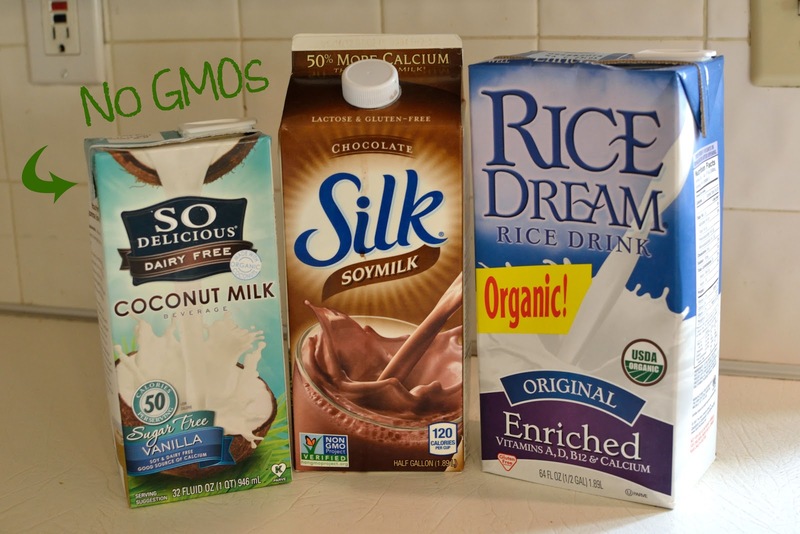 Soy products. 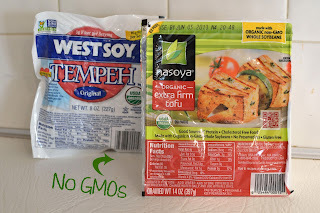 I was always a stickler when it came to getting my tofu and tempeh organic, but as you'll see later this wasn't always the case with other soy products. Nonetheless, these two were safe! 5. Sweets/Sugar. 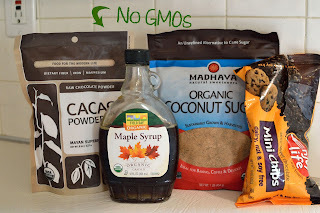 I steer away from traditional white sugar and syrups as much as possible and stick to natural sweeteners like: Madhava Organic Coconut Sugar (labeled with Non-GMO Project Label), and Field Day Organic Grade B Maple Syrup (labeled USDA Organic and according to their website, also Non-GMO Project labeled). In my baking I rely quite heavily on Enjoy Life's Mini Chips and although my bag did not state it, their website confirms that they are part of the Non-GMO Project. Last but not least, Navitas Natural's Cacao Powder that makes my smoothie-world go round, these are labeled USDA Organic and Non-GMO Project. 6. 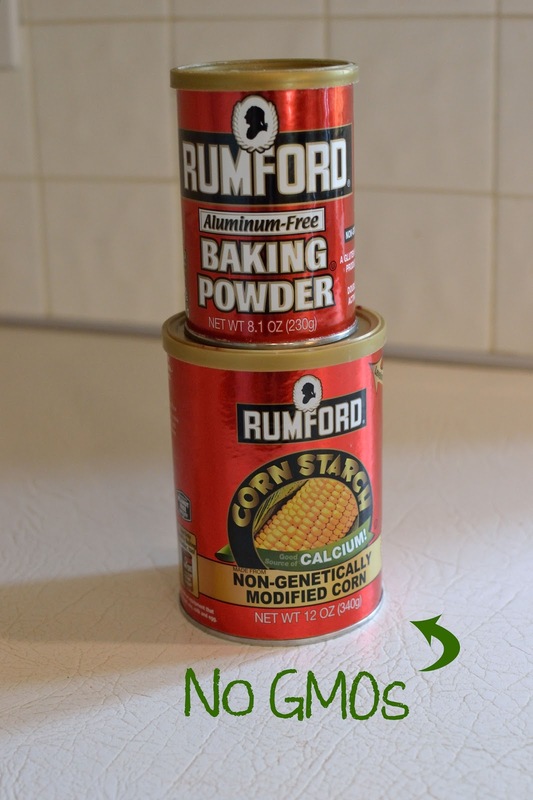 Baking Powder/Corn Starch. 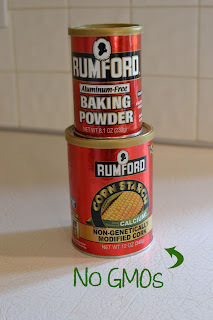 I use: Rumford Corn Starch (which states on the package: "Non-Genetically Modified Corn") and since corn starch is used to make baking powder, I also have the Rumford Brand of Aluminum-Free Baking Powder (labeled Non-GMO). 9. Cheese (Vegan Cheese that is). 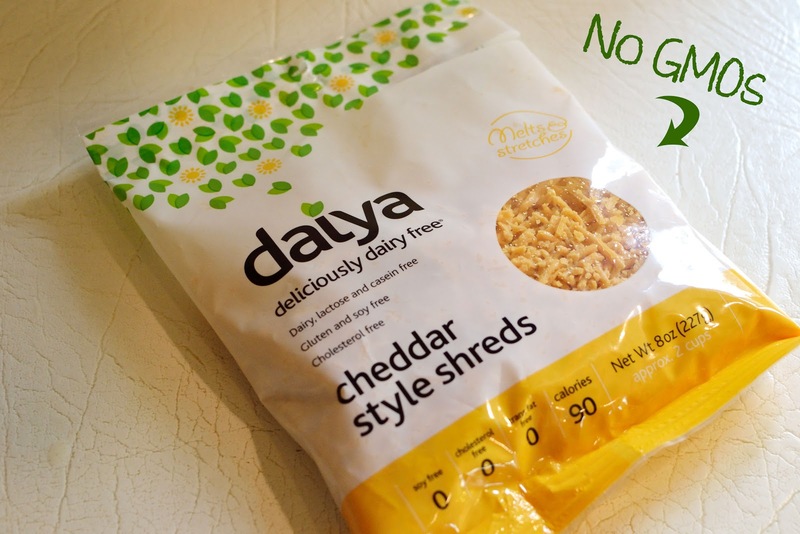 Daiya Cheddar Style Shreds (some ingredients are labeled Non-GMO on the package, but the brand is confirmed as being GMO-free on their website here). 10. Soda. 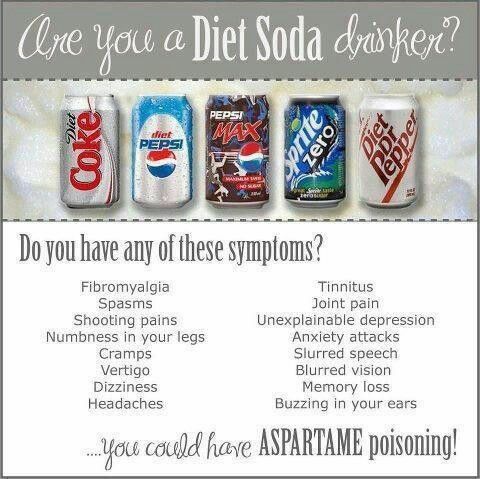 Now I am not a soda person, I haven't drank it in years, but Brandon still drinks it. 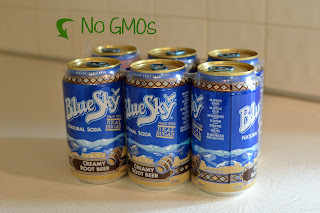 So I keep some Blue Sky Natural Soda on hand. (labeled Non-GMO). 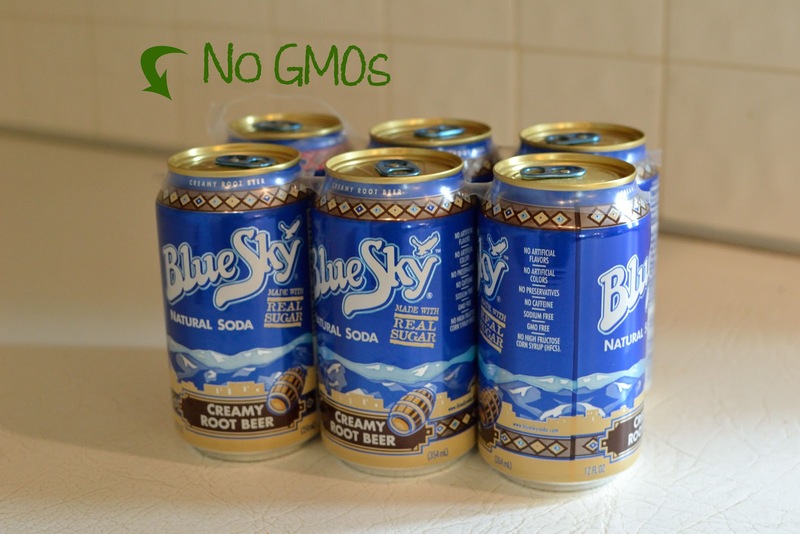 On top of that, Blue Sky is also caffeine-free, preservative-free, and free from artificial colors. Then came the foods that I thought of immediately after watching the film, and I thought, "Oh that's gotta be GMO...shoot!" 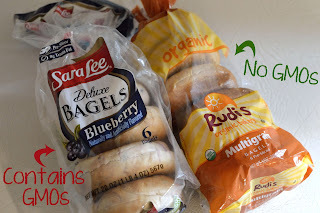 Luckily a day or two after making some of these discoveries, I headed to the grocery store and was able to find non-GMO alternatives, so take a look below. 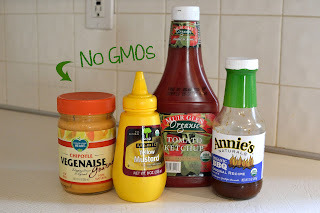 You can find the ingredients listed of the GMO-containing food and I will highlight the possible GMO ingredients to the best of my knowledge, and in case you need a refresher, check the list above of the 4 main GMO crops, and here's a link to those other smaller GMO-ingredients. 1. 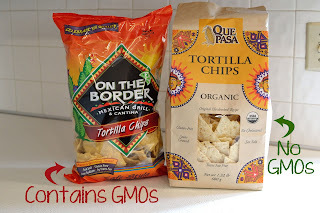 Corn chips: Ingredients in On the Border Tortilla Chips: Stone Ground Corn, Vegetable Oil (contains one or more of the following: Canola, Corn, Cottonseed, Safflower and/or Soybean Oil) Salt. Non-GMO alternative: Que Pasa Organic Tortilla Chips (labeled USDA Organic and Non-GMO). 2. 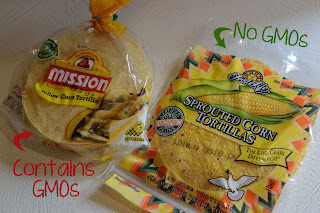 Corn tortilla shells: Ingredients in Mission Yellow Corn Tortillas: Ground Corn Treated with Lime, Water, Cellulose Gum, Propionic Acid (to preserve freshness), Benzoic Acid (to preserve freshness), Phosphoric Acid (preservative), Dextrose, Guar Gum, Amylase. 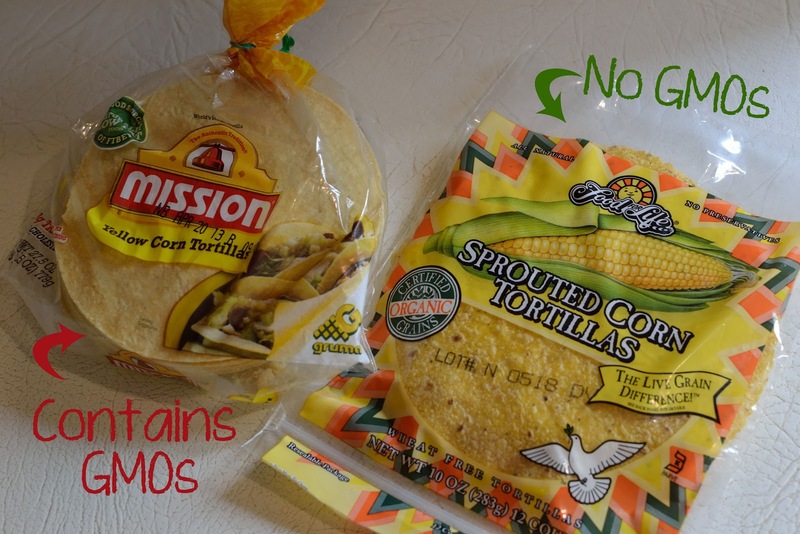 Non-GMO alternative: Food For Life Sprouted Corn Tortillas (labeled USDA Organic). 3. Wheat tortilla shells: Since I was swapping out my tortilla shells, I figured I would give Brandon's wheat ones a swap too! He used to use Ole Xtreme Wellness! 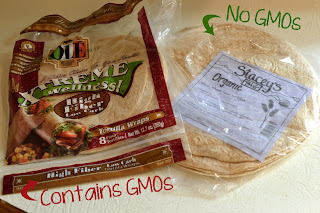 High Fiber Low Carb Whole Wheat Tortilla Shells, Ingredients: Whole wheat flour, Enriched bleached flour (Wheat flour, Malted barley flour, Niacin, Reduced iron, Thiamine mononitrate, Riboflavin and Folic acid), Water, Cellulose fiber, Wheat gluten, Extra virgin olive oil; Contains 2% or less of the following: Xantham gum, Guar gum, Salt, Mono and diglycerides, Baking powder (Sodium acid pyrophosphate, Monocalcium phosphate, Baking soda), Calcium propionate, Sorbic acid (Mold inhibitor), Fumaric acid, Carboxymethyl cellulose, Sugar, Dough relaxer (Sodium metabisulfite, Corn starch, Microcrystalline cellulose, Dicalcium phosphate), Enzymes. 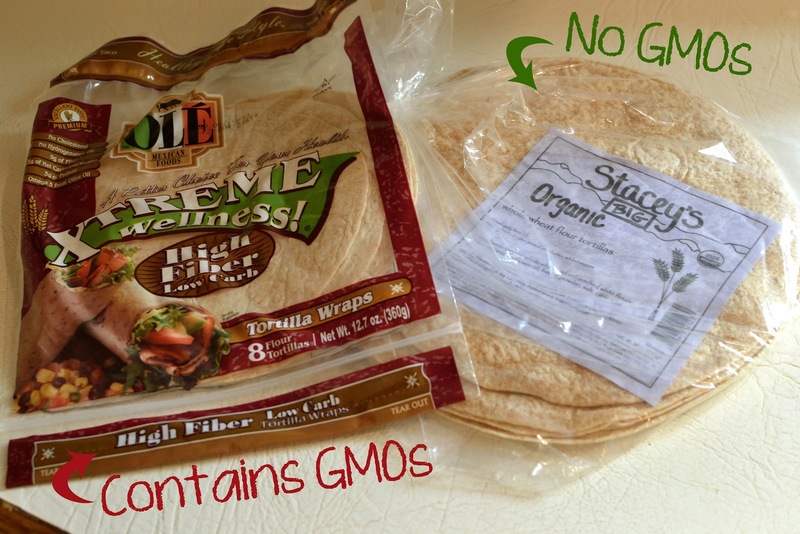 Non-GMO alternative: Stacy's Organic Whole Wheat Tortilla Shells (labeled Organic and Non-GMO). Non-GMO alternative: Rudi's Honey Sweet Whole Wheat Bread (labeled USDA Organic and Non-GMO). Non-GMO alternative: Rudi's Multigrain Bagels (labeled USDA Organic and Non-GMO). 6. 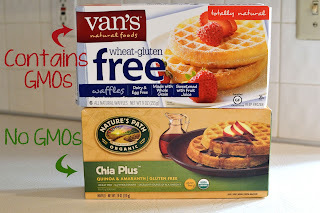 Gluten-Free Waffles: I really thought this brand of waffles was surely GMO-free, heck they even have some products that are organic, but apparently none at this time that are gluten-free, read more here. 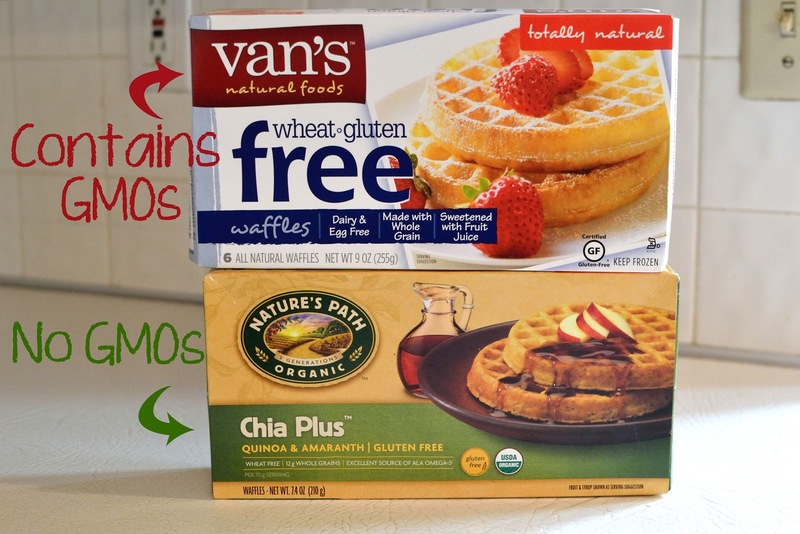 Ingredients in Van's Wheat-Gluten-Free Waffles: Water, Van’s Gluten Free Mix (Brown Rice Flour, Potato Starch, Rice Flour, Soy Flour), Canola Oil, Van’s Natural Fruit Juice Blend (Pineapple, Peach and Pear Juice Concentrates), Baking Powder (Sodium Acid Pyrophosphate, Baking Soda, Rice Flour, Monocalcium Phosphate), Sea Salt, Soy Lecithin, Guar Gum. Non-GMO alternative: Nature's Path Organic Chia Plus Gluten-Free Waffles (labeled USDA Organic and Non-GMO Project). 7. Breakfast Cereal: When it came time to dig and find our GMO cereal, we were in good luck...it was all gone, so it was the perfect time to stock back up on some Non-GMO cereal. But just for fun, let's take a look at a common and child-favorite cereal, Kellogg's Froot Loops. Ingredients in Sugar, corn flour blend (whole grain yellow corn flour, degerminated yellow corn flour), wheat flour, whole grain oat flour, oat fiber, soluble corn fiber, contains 2% or less of partially hydrogenated vegetable oil (coconut, soybean and/or cottonseed), salt, red 40, natural flavor, blue 2, turmeric color, yellow 6, annatto color, blue 1, BHT for freshness. 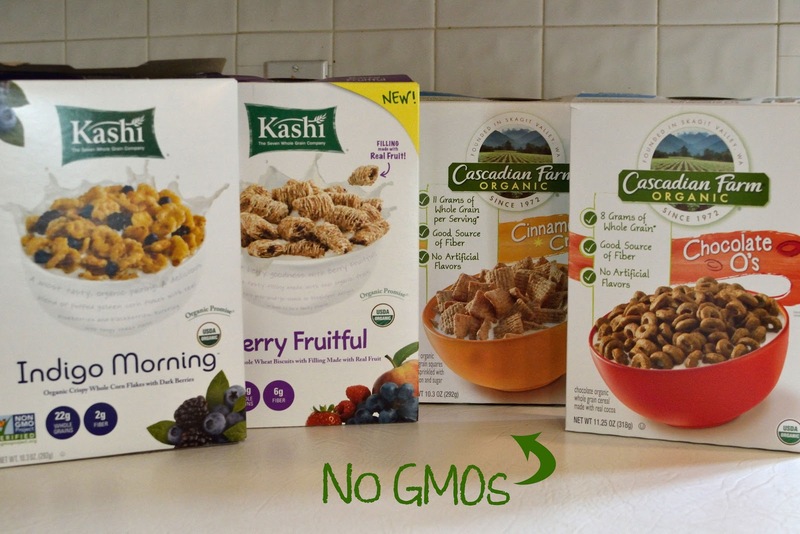 Non-GMO alternatives Kashi Indigo Morning (labeled USDA Organic and Non-GMO Project). Kashi Berry Fruitful (labeled USDA Organic and Non-GMO Project). 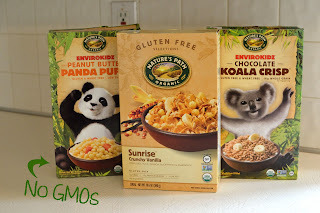 Nature's Path Organic Envriokids Peanut Butter Panda Puffs (labeled USDA Organic and Non-GMO Project). Nature's Path Organic Sunrise Crunchy Vanilla (labeled USDA Organic and Non-GMO Project). 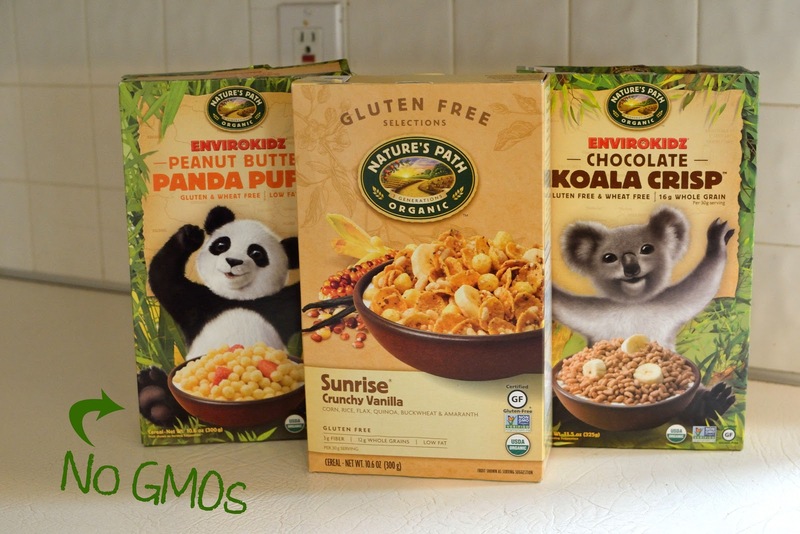 Nature's Path Organic Envriokids Chocolate Koala Crisp (labeled USDA Organic and Non-GMO Project). 8. Veggie Burgers: Being gluten-free and vegan, most of my veggie burgers were organic or Non-GMO, but Brandon's wheat/soy burgers were not. Case in point: Boca All-American Flame-Grilled Veggie Burgers. Ingredients: WATER, SOY PROTEIN CONCENTRATE, REDUCED FAT CHEDDAR CHEESE (PASTEURIZED PART-SKIM MILK, CHEESE CULTURE, SALT, ENZYMES, ANNATTO (COLOR), VITAMIN A PALMITATE), WHEAT GLUTEN, CORN OIL, CONTAINS LESS THAN 2% OF METHYLCELLULOSE, HYDROLYZED CORN PROTEIN, WHEAT GLUTEN AND SOY PROTEIN, SALT, CARAMEL COLOR, CHEESE POWDER (CHEDDAR CHEESE (MILK, CHEESE CULTURE, SALT, ENZYMES), CREAM, SALT, SODIUM PHOSPHATE, LACTIC ACID), DRIED ONIONS, YEAST EXTRACT, NATURAL FLAVOR (NON-MEAT), SESAME OIL, DISODIUM GUANYLATE, DISODIUM INOSINATE, BROWNED IN CORN OIL. 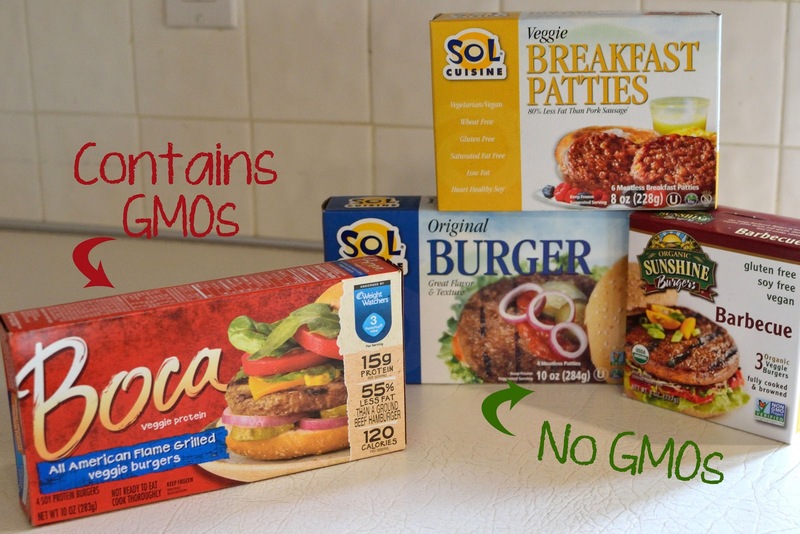 Non-GMO alternative: Sol Cuisine Original Veggie Burger (labeled Non-GMO Project). is the soy in gardein™ non-gmo? yes. we only use 'identity-preserved' soy protein (which basically means, it helps to ensure us that our soy protein is not genetically modified). 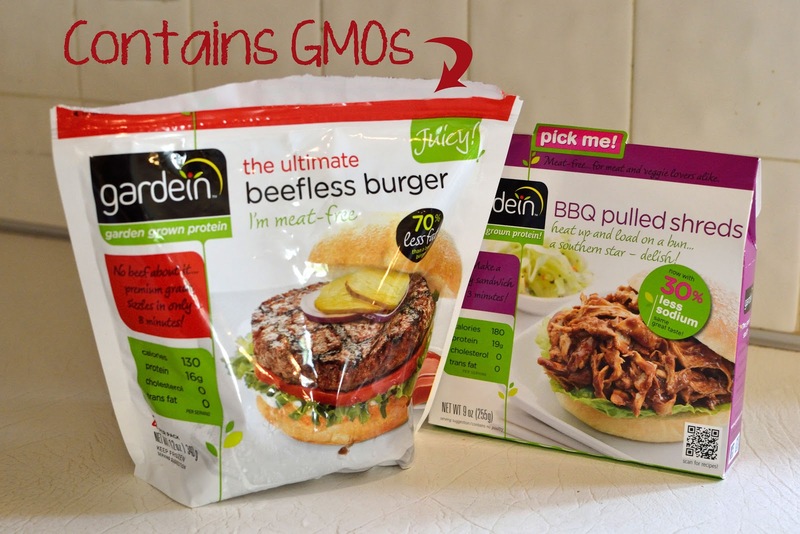 Ingredients in Ultimate Beefless Burger: water, soy protein concentrate*, textured wheat protein (wheat gluten, wheat flour, malt), vital wheat gluten*, organic ancient grain flour (kamut ®, amaranth, millet, quinoa), expeller pressed/canola oil, soy protein isolate*, onions, natural flavor (from plant sources), modified vegetable gum, malted barley extract , yeast extract, potato starch, garlic powder, onion powder, organic cane sugar, vinegar, sea salt, pea protein, carrot fiber, organic beetroot fiber, spices. 9. Spaghetti Sauce: Really thought this one was harmless, but I was wrong. Time to switch to organic! Ingredients in Great Value Chunky Italian Garden Pasta Sauce: Tomato Puree (Water, Tomato Paste), Diced Tomatoes In Puree, Onions, Sugar, Soybean Oil, Celery, Green Bell Peppers, Carrots, Zucchini, Salt, Garlic Powder, Onion Powder, Spices, Parsley, Natural Flavor, Citric Acid. Allergy Warning: May Contain Traces of Milk. 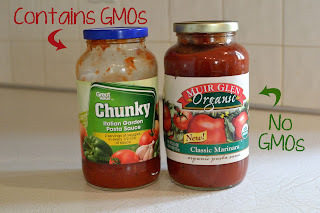 Non-GMO alternative: Muir Glen Organic Classic Marinara (labeled USDA Organic). 10. Vegan Cream Cheese: Really thought this one was safe too! But I guess goes to show that just because it's vegan and you buy it at a health food store, doesn't always mean that it's GMO-free. Ingredients in Tofutti Better Than Cream Cheese Imitation Cream Cheese: Water, partially hydrogenated soybean oil, isolated soy protein, maltodextrin, tofu, nondairy lactic acid, sugar, locust bean, guar and carrageenan gums, sugar, salt, veg. mono and diglycerides, potassium sorbate (added as a preservative). 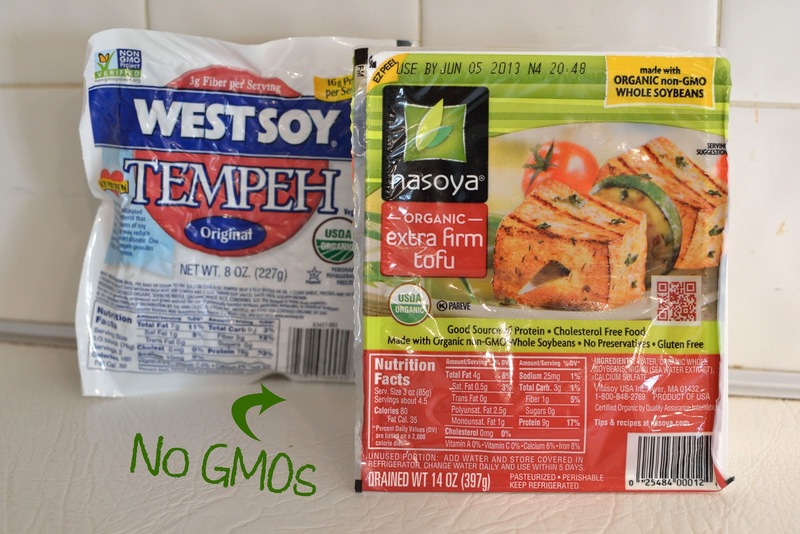 "Does Tofutti use non-GMO soy protein? All of our products use non-GMO soy protein. 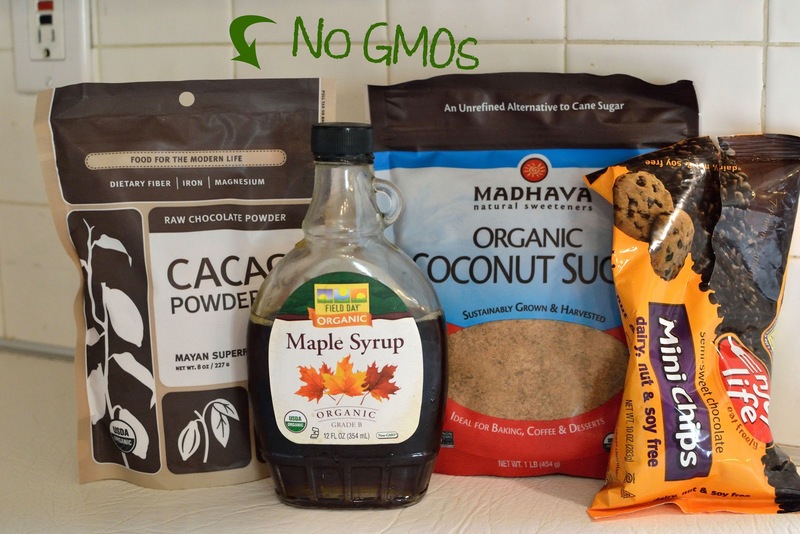 In addition, if available, we use other non-GMO ingredients, such as our tofu powder and maltodextrin." To me, that's better than being fully GMO, but I'd love to it to just be GMO-free. 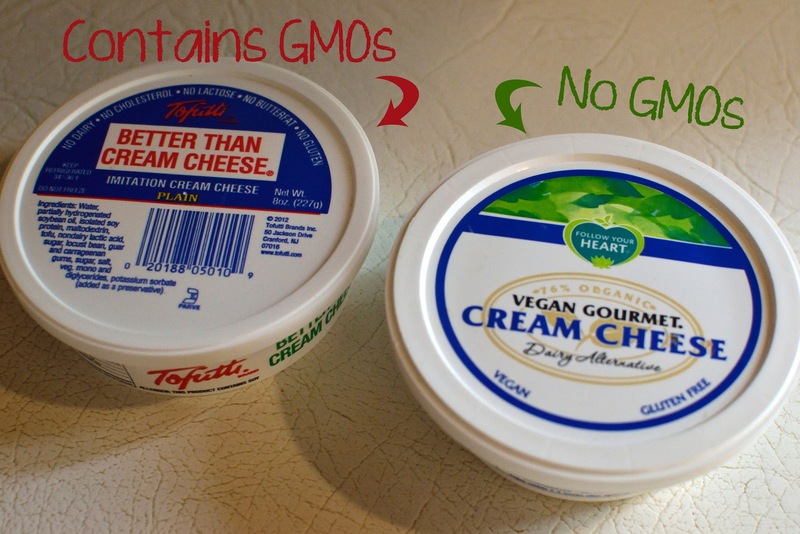 Non-GMO alternative: Follow Your Heart Vegan Gourmet Cream Cheese (labeled USDA Organic). 11. Fries: I like to make most things from scratch, but sometimes there is just not enough time! One thing we like to get pre-cooked are Alexia Sweet Potato Julienne Fries and I figured they were a healthy alternative...but what do you know, GMOs were lurking. Check out the ingredients: Sweet Potatoes, Canola Oil and/or Sunflower Oil and/or Safflower Oil, Rice Flour, Tapioca Starch, Natural Cane Sugar, Cornstarch, Tapioca Dextrin, Sea Salt, Chili Pepper Powder, Salad Mustard (Distilled Vinegar, Mustard Seed, Salt, Turmeric, Paprika), Xanthan Gum, Gluconic Acid. 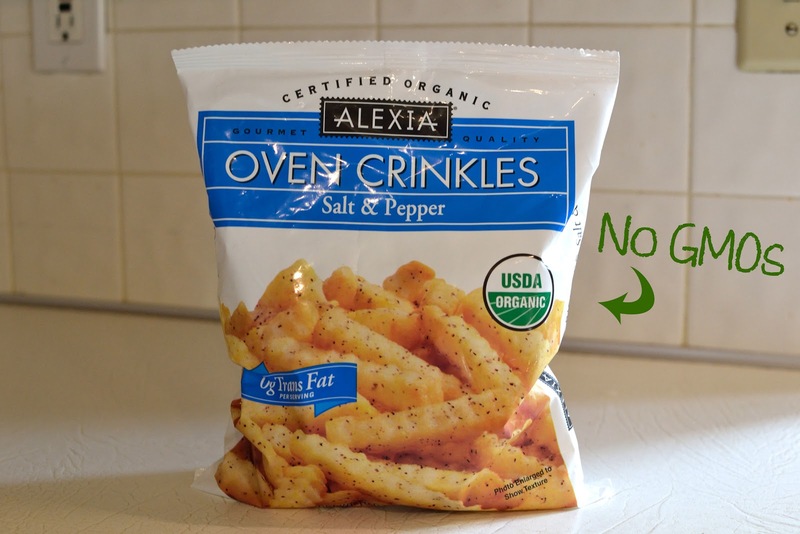 Non-GMO alternative: I didn't have to look far, Alexia actually has a line of organic fries, they're not sweet potato, but they're GMO-free. 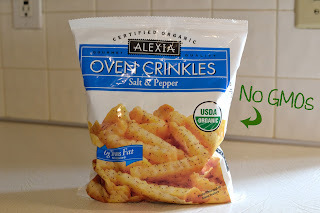 Alexia Oven Crinkles Salt & Pepper Fries (labeled USDA Organic). 12. Chips: I don't have any GMO example pictures to show you, but here's the ingredients of a common brand of chips, Lay's Barbecue Flavored Potato Chips: Potatoes, Vegetable Oil (Sunflower, Corn/and Canola Oil), BBQ Seasoning (Sugar, Salt, Corn Sugar, Malted Barley Flour, Onion Powder, Yeast, Molasses, Spices, Garlic Powder, Natural Flavors, Paprika, Tomato Powder, Corn Starch, Yeast Extract, and Paprika Extracts. 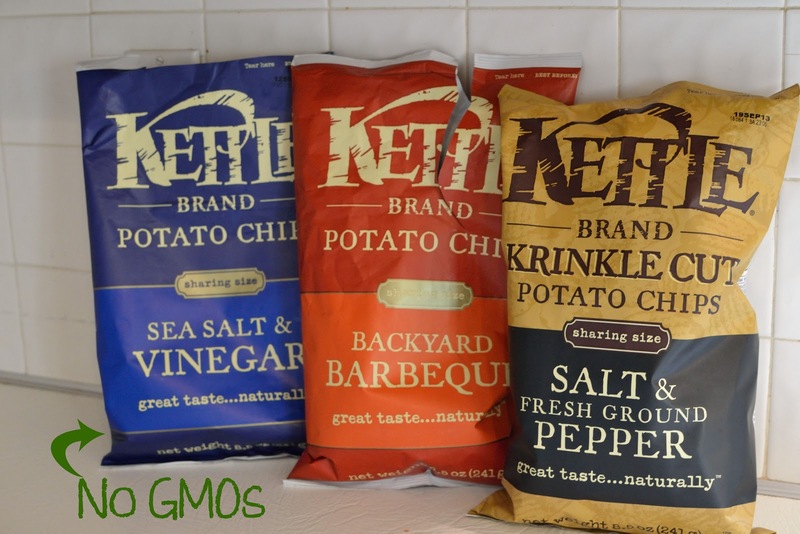 Non-GMO alternative: Kettle Brand Potato Chips (labeled Non-GMO). 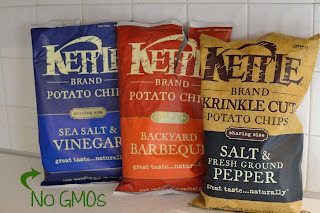 We love the flavors: Sea Salt & Vinegar, Backyard Barbecue, and Salt & Fresh Ground Pepper. 13. Cookies/Oreos: Someone in my house has a sweet tooth, can you guess who it is? That would be Brandon! 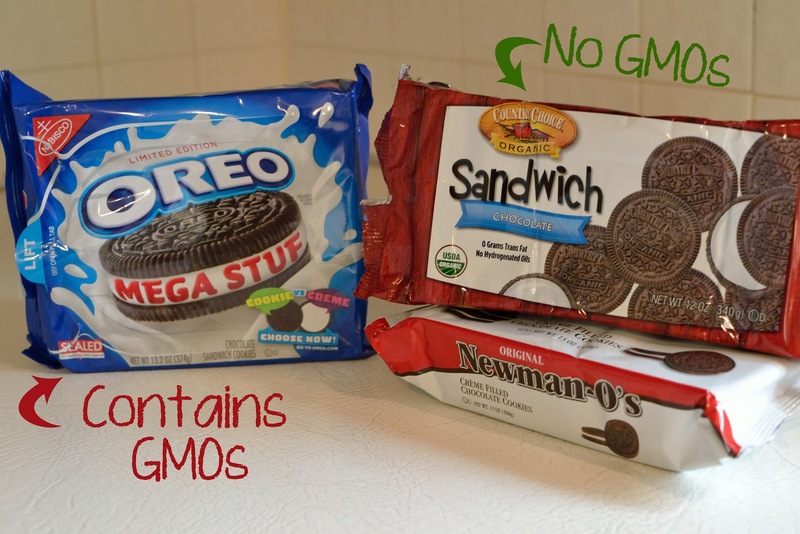 Oreos are one of his favorites and when it came to GMO-hunting there was no hiding these treats. Ingredients in Oreos: SUGAR, ENRICHED FLOUR (WHEAT FLOUR, NIACIN, REDUCED IRON, THIAMINE MONONITRATE (VITAMIN B1), RIBOFLAVIN (VITAMIN B2), FOLIC ACID), HIGH OLEIC CANOLA OIL AND/OR PALM OIL AND/OR CANOLA OIL, COCOA (PROCESSED WITH ALKALI), HIGH FRUCTOSE CORN SYRUP, CORNSTARCH, BAKING SODA, SALT, SOY LECITHIN (EMULSIFIER), VANILLIN - AN ARTIFICIAL FLAVOR, CHOCOLATE. Newman-O's Cream-Filled Chocolate Sandwich Cookies (labeled Organic). 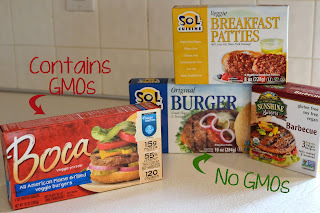 So there you have it, most of the swaps that took place within my house once I had what I call "my GMO-awakening!" I hope you found it helpful. But my final tip is to make things yourself. Things like hummus and salsa, pancakes and muffins, all are frequent items I add to my weekend to-do list so I'm stocked and ready for the week. 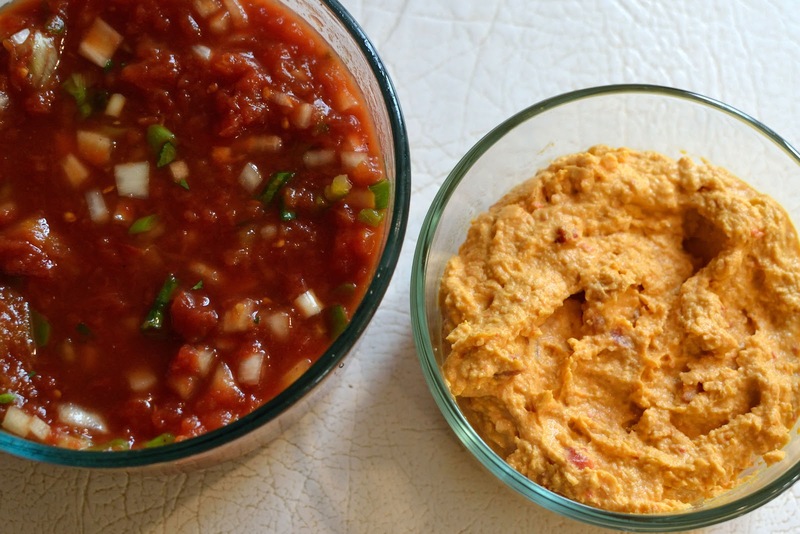 This way I can control the ingredients, keep out the preservatives, and usually save some money. My homemade salsa and red pepper hummus. Still want to learn more? Check out one of my no-GMO heroes, Robyn O'Brien who is being called "The Erin Brockovich of Food" in this Ted Talks she did about changing the food system one step at a time. She also has an excellent book about the topic called The Unhealthy Truth. I highly recommend it! I'd like to think that I covered it all in this massive post, but I'm sure I will be back with more info about my family's switch to a GMO-free diet. 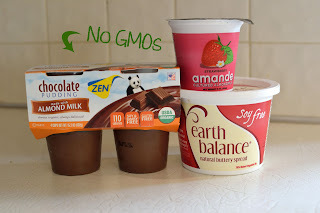 I will continue to post new brands, stores, and other Non-GMO products, and even some of my favorite GMO-free recipes. 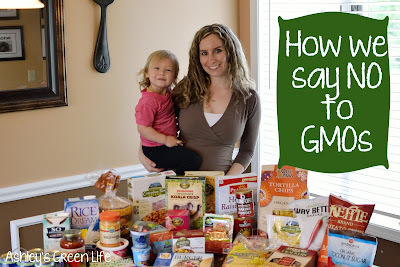 Now it's your turn...what's your GMO-journey look like? Are you open to the idea of changing? Are you already GMO-free? What tips can you share, how do you make it work for you, your family and your budget? I'd love to hear it so we can all learn from each other. 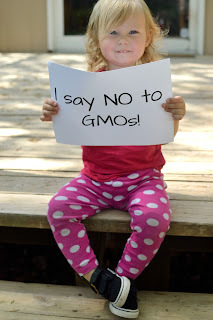 Until next time, keeping on saying "NO" to GMOs! Your body, family, and the environment will thank you. Sooner or later lawmakers, corporations, food manufacturers will get the message...but until then YOU have the power. Vote with your fork! Great post. Here is a suggestion. Look into paleo (paleo diet) if you havent already, even if you dont do the meat thing there is a lot of good information to be learned. It has done wonders for my family and I. Especially with my husbands intestinal problems! 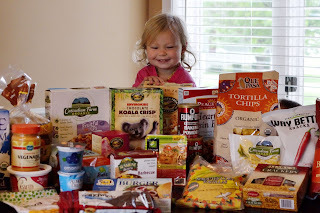 We try and eat no processed foods, ie nothing in a wrapper, bag, carton, etc. Occasionally we indulge, but everone has their standars and levels. Also, look into soy. Most of it is gmo, and even if its not, its uber processed, increases estrogen, and other adverse effects. 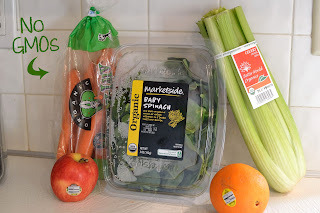 Just because its organic doesnt mean its good for you! I've been hating GMO's and specifically- the Monsanto devil machine! It's horrifying! I was stunned when Prop 37 didn't pass in California. I honestly thought so many people there would vote for common sense. I've been researching it myself for awhile and have now learned more from you. Thank you! It's pretty sad that we live in a world where we have to spend so much time trying to ensure we're not poisoning ourselves. Sigh. Hoping more people wake up and start caring and getting angry! Thanks for all you do for us! !